Please note that it is your responsibility to read this covenant fully, whether you are a resident or visitor. Every visitor has to abide by the LL Terms of Service (ToS) and Community Standards (CS) of Second Life. Alba Islands and Alba Estate is a private, virtual land rental provider within Second Life. You don’t need a premium account; just a basic one will do in order to rent a home. Go to https://join.secondlife.com/?lang=en-US and join in the experience. The following are in place to ensure a pleasant and enjoyable environment for all within Alba Estate. Request to use your own homes. No harassment of any form or abusive language in public access locations. This includes outside of your house as this is deemed public. Sexual acts for example need to be inside your home. No griefing, prim littering or running scripts causing heavy server load. Do not enter any private homes/non-commercial property without the owner’s permission. If a door is locked, it is obvious that visitors are not allowed to enter by themselves. No weapons are permitted at all. This includes non-functional weapons. Left-click the rental box and select ‘Info’. This notecard contains essential information. Once satisfied, click the rental box again and pay the amount required. It will then change to a bird box. A group invite is then sent to you. Join this group. The group name will begin with ‘T S I P’. To add a co-renter such as a partner, select the rental box again and choose ‘Tenant’, then ‘Add Tenant’ and type their name into the blue dialog box that appears, click ‘Submit’. Your co-renter is then added. Please note that this should be their SL name. If you do not receive a group invite, please wait for 3 minutes and then touch the rental box again and look for the Group Invite button. If this fails then please contact Todalerdale Stine. When renting, it is acknowledged that you have decided to rent that parcel for the time specified in the rental box. Therefore think carefully on your intent to stay as refunds will not be issued. This also applies should you wish to move to another parcel within the Estate in that your remaining rent amount or time will not be transferred to another rental box. Other Estates may do this but we do not. The Estate follows a nature/mountain theme and as such, log cabins, homes with brick, stone, wood houses etc are generally acceptable. Medieval castles, forts, tree houses, etc are not acceptable. Nothing is to be placed on roofs of any homes with the exception of such items as a chimney, solar panels, roof tiles. ECO style homes may have grass on the roof if designed that way. Requests to use your own homes. Normally as a rule of thumb and because of past tenants doing the flit after one month, a request is allowed only if the tenant has been with us for over 6 months and really no less than 3 months. So just three requirements, and we do have to insure that they are met before any consideration is taken to grant the replacement of any estate homes to the one you wish to use instead. example (estate home 25 x 35 replacement home 25 x 35 or less, never any larger. rental , Then the rental box will be adjusted also to reflect the new level of usable prim for the following months. 3: If the estate home is one story high then the new home really should be one story high, never any higher than the trees, its also worth mentioning that we wont flatten or alter the shape of the land for a home replacement, nor will we remove estate trees,shrubs or flowers off the parcel. if you feel your request can accommodate the above three requirements, please by all means send me a LM or Market place listing page link, I will be happy to take a look and see. Residential skyboxes/platforms must be 500 meters or more above ground. Commercial properties such as Malls, clubs, casinos, and stalls are not permitted. Subletting to another person or bot is not permitted. It is your responsibility to know your usable prim limits and how many you have available at any given time. To assist with this, each rented parcel has a prim counter which can be clicked and reports the number of usable prims you have used/have remaining. In addition make sure you keep some prims available if possible (32 is ideal). This will allow you to temp rez items such as delivery crates, bags etc that you need to rez in order to receive your items or for when you need to rez your boat for example. If you are the type who likes to build, then you must rez a platform above 500 metres and build there. Raw prims are unsightly and will be returned if left out and seen. Mega-prims must never be used within the Estate. If you need to rez any then please travel to a Sandbox sim. The Estate is themed to that of the west coast of Scotland and is residential by default. There are exceptions to this and are subject to agreement with the Estate owner. Residents may not use their rented parcel for business or commercial operations of any kind and includes but is not limited to ‘not-for-profit’ operations. The setup of charity or volunteer organisations must be agreed prior to establishment. Any items placed in the water must be set to phantom only placed within your parcel, not estate land. If you require a dock, then we may alter your visible parcel border to accommodate your dock. Boats must be less than 12 meters in length. This can be relaxed if you wish to live on a boat and not have a house. Privacy is a key element for us all and spychat or spyware is NOT permitted whatsoever and includes anything that records chat from other SL residents. If one is discovered on the Estate and owned by you, you will be summarily banned from the Estate and a report filed to Linden Labs with supporting evidence. Rents paid will not be refunded. We periodically sweep the Estate for these so do not use them. When placing your own flora or fauna (trees/bushes/animals etc) on your parcel, please keep in mind that the Estate follows the seasons and lot of thought, effort and real-life money has been spent on Estate flora/fauna and aims to follow the west coast of Scotland theme. With this in mind, please don’t leave parcels empty and try to use the same creators of Estate flora/fauna that we have. Common sense applies and we should not see herds of elephants, wildebeest or flocks of flamingos. If you want more trees and don't wish to buy them we can place some of our stock on your parcel for you but these will count against your usable prim allowance. Full-bright textures, including flora/fauna, should not be visible outside of your home. Rotating, animated or flashing lights are not permitted. Other than trees, nothing should be higher than the rented home or building on your parcel. Privacy is something everyone desires at times and this should be respected. Privacy is enabled on all parcels and limits media, voice, gestures, chat and AV visibility to that parcel. Privacy does not stop others from seeing items rezzed in your home and parcel. Security is provided and automatically enabled for residents when they rent a home and this is facilitated by an estate security alarm system Alba Security Image. normaly positioned on the outside wall of that rented property. The security box does not extend coverage over water as this is considered public access within the Estate. These comply with LL ToS and will eject an intruder from the land parcel after 30 seconds. Repeat offenders (griefers) will be banned from the Estate. Personal security systems (security other than the estate provided one) are not permitted in order to ensure consistency and appropriate coverage. Please keep in mind that other residents or visitors may trigger a security alarm accidentally when walking around and exploring which is why a 30 second warning is issued. Normally they will leave the parcel and either ask to be allowed (guests) or even apologise for the intrusion. You shouldn’t be overly concerned as the security box is doing its job. Always be polite. Should the person be an actual intruder then the system will eject them from the parcel and ultimately ban if repeated entries are tried. Locate and click on the security box which sits on the outside wall of your home. A number of options are displayed. To add a co-renter (partner for example), select ‘addadmin’. The security system will display names within range. Select the name of the person you wish to add as a co-admin. They will then have the ability to start/stop security. Anyone in the same group TSIP (your cottage group) will be added automatcily to the security system access list. There are several ways of adding and removing people in the ban-list. The easiest way to do this is by clicking on the security box, then clicking the “Ban/Unban” button. Then you will be able to add and remove avatars by just clicking on their names in the popup user-interface. People passing along the waterways or if above 60 metres in height will not activate the security system. 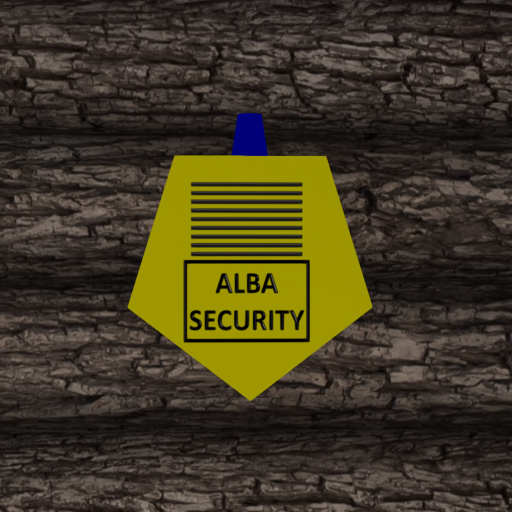 Alba Estates appointed managers cannot be ejected by the security system. Security orbs/systems not belonging to the Estate will be returned. Try to minimize the amount of devices with lagging scripts on your land. A large number of scripts with a large number of listeners are bad. If you are running scripts on your parcel which significantly impacts the overall ability of the Region to operate efficiently they may be disabled or the object containing them returned to you. If you have a bed or any item that can be turned off then please do turn them off. A maximum of two scripted/regular pets are permitted. AV pets (one's that are human controlled and not scripted) are welcome. No Breeding of pets or animals allowed at all. You must set your scripted pets to sit and not wander around the home or grounds while you are not at home. You must make sure that each pet does not bump into any other objects in or around the home. You must take back your pet at least once a week into your inventory. This avoids script issues. You must take pets back to inventory if you are not going to be in world for more than 2 days or going on real-life vacation. They will be returned if left unattended for more than two days. This is managed by the Estate owner Douglas Todalerdale Stine and only minor terraforming will be done to smooth land for a build and at the discretion of Douglas Todalerdale Stine. Terraforming of land that will take away water. Change the overall look of the parcel or something that affects a neighbour. Rentals or leased land will be reclaimed by Estate staff if you fail to pay rent on time or ignore/flout items listed in this covenant. A grace period for overdue rents is given at the discretion of the Estate owner. A grace period will not be given if due rent is habitually late. In the event of reclamation and if you are absent, all objects owned by you will be returned. The Estate owner is not responsible for returned objects failing to appear in your inventory. If returned objects are not in your inventory, you should contact Linden Lab Support directly and not the Estate owner. Rental Cottages where the rental box has been set to ‘Not Renewing’ and/or in which the renters objects have been removed (renter has clearly left and has not returned in days) will be considered abandoned and will therefore once again be set as available for rent by others. Leased land that is left empty (no objects from renter) for more than four days will be considered abandoned and will therefore once again be set as available for lease by others. In most cases, a message will be sent to the Lease Holder asking if they are returning. The payment you make to ‘Buy’ the land is your first month's tier (there is a four week minimum). Read this covenant. By leasing (Buy) the land you are stating that you have read and agree to this covenant. ‘Buy’ the parcel for the price indicated on the land. To "buy" the parcel, right click the land and select ‘Buy’. You must agree to the covenant before the purchase will be finalized. PLEASE! DO NOTHING WITH THE LAND UNTIL YOU ARE CONTACTED WHICH WILL BE WITHIN 12 HOURS (often less). You will be invited to a group for that parcel and the land deeded accordingly. If the land does not have the settings as indicated above then we will contact you to correct it. Must be approved first by Todalerdale Stine (Owner) or appointed Estate Manager. Do not place a home on the land until it has been approved. Own homes must be no more than 10 - 12 metres high above ground level. This is including the roof and must be appropriate/suitable for the surrounding environment of the Region you are on. You must also leave a distance of 4 metres from the edge of the visible parcel. Don’t risk spending L$ on something that may not be allowed. Check first! No more than 1 house is allowed at ground level on one land parcel. Off-sim formations must be approved before placement and must be set to phantom. These Regions may be stand-alone and not connected or cut up in to smaller parcels. These are rented or bought as one whole Region and do not have a covenant or theme. The only rule (contract) you have is with Todalerdale Stine and this will be agreed on a case-by-case basis. You will be given a notecard outlining the issue and will then have 24 hours to correct before rental reclamation is carried out and your objects returned. This does not include use of spyware which is subject to instant ban and reclamation without refund. Your Leased land will be repossessed and no refund issued, for remaining Lease tier fee’s or Rentals. Todalerdale Stine has the right to modify and append to these covenants as deemed fit. You will not receive notification of minor updates unless something is added or amended that affects you.